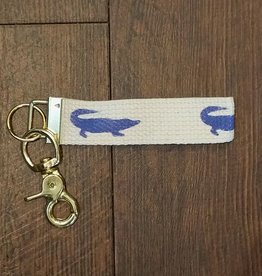 Clip it on your purse or your keyring, the Cabo keychain adds extra style to anything you attach it to. Cotton webbing with brass clip. Sweet little gift for that new resident of Gator Nation. Cute to add to a bag, or actually use for a keychain! Go Gators! Cotton webbing with brass clip. Unicorn. Yes. Adorable leather key ring in assorted colors (feel free to email or call to find out available colors). LIttle panda constructed of three pieces for cute effect. Adorable elephant and dog also available!